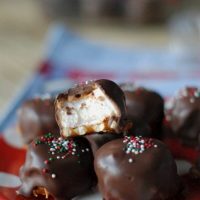 These Butterscotch Marshmallow Bites are simple and quick no bake treats! Each Christmas I make dozens and dozens of cookies. I don’t know why I make that many, I guess Christmas is just the perfect time to try out all the new recipes I’ve collected over the course of the year. The kids are eager to help with the planning and the baking. I always picture the four of us in the kitchen in a Norman Rockwell-esque sort of seen. You know, with dabs of flour on our noses, aprons on, smiling and laughing. But the truth is, our real life family baking time is much more chaotic and stressful. What usually happens is the three kids fight over who gets to stand where and who gets to do what. I lose my train of thought and get annoyed by how little space I suddenly have. Eggs get dropped, only half the ingredients actually seem to make it into the bowl, flour is everywhere: on the counters, on the floor, on the dog, in my youngest’s mouth….by the halfway point, the kids have dug into the bags of chocolate chips. Intense negotiations swirl around me as the kids vie for various utensils and bowls to lick. And once they actually obtain those, they scatter like leaves. I am left with the dusty mess. I’m going to try something a little different this year. 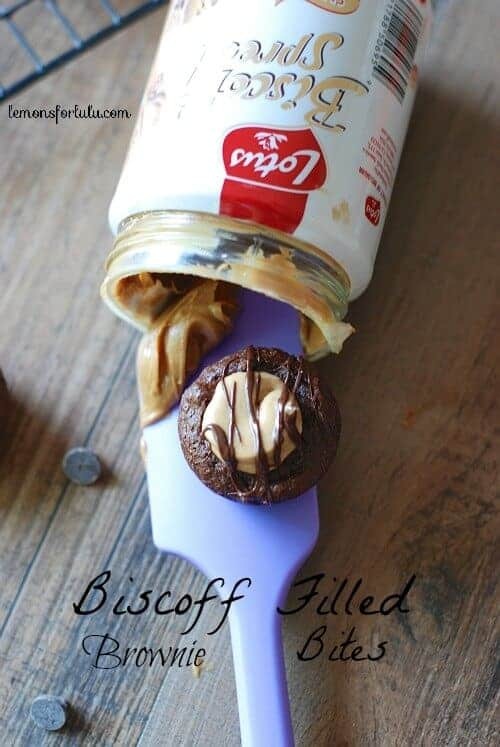 I’m going to skip the floury tornado and make no bake treats instead! Correction, the KIDS can make no bake treats. 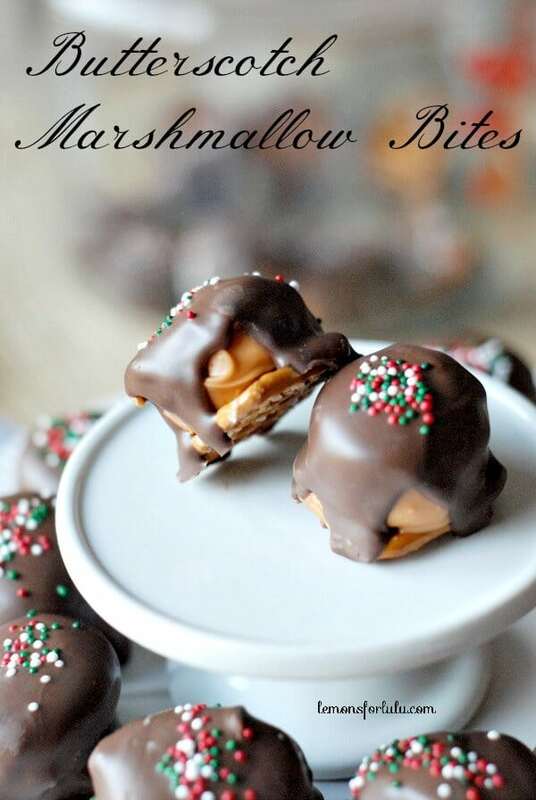 These butterscotch marshmallow bites are so quick and simple! My youngest can line the pretzels, my son can melt the chocolate and my oldest can dip the marshmallows! Everyone wins-except me because I will now be left with a chocolate mess to clean up. But that’s ok, because for 20 minutes our kitchen will be filled with harmony! Place a large baking rack over wax paper. Arrange pretzels over baking rack. In a microwave safe bowl combine butterscotch chips and shortening. Melt in 30-second intervals stirring constantly. Dip each marshmallow half in melted butterscotch. Using two forks, gently place marshmallows onto pretzels. In another microwave safe bowl, melt chocolate candy coating and remaining 3 tablespoons of shortening. Stir every 30 seconds until melted. 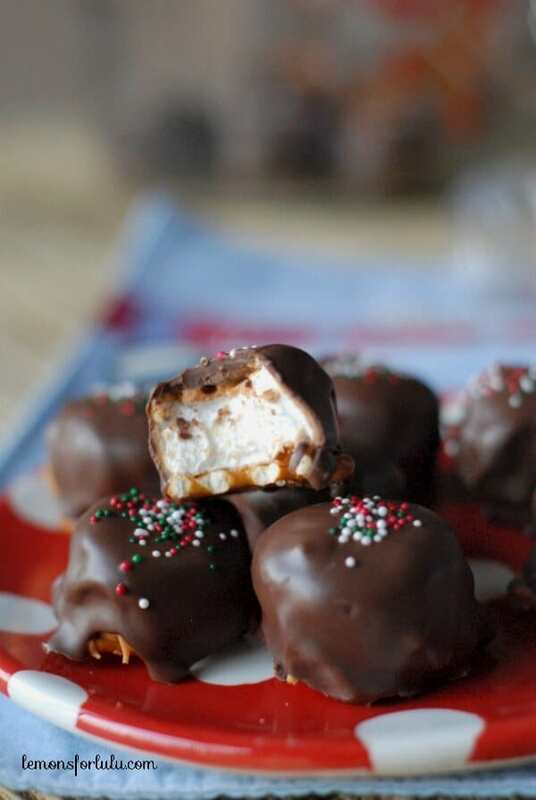 Pour about a tablespoon of chocolate over each marshmallow allowing chocolate to drip down sides. Decorate with sprinkles if desired. Allow marshmallows to set for about 30 minutes. Oh, these are just the right size to be dangerous! These look amazing! I love your post so much! How I can relate to those blissful wishes of a picture perfect baking day – and the harsh reality of a kitchen that looks like it was tossed by the CIA, lol! Actually, I can’t even blame the poor kids any more, I’m worse! 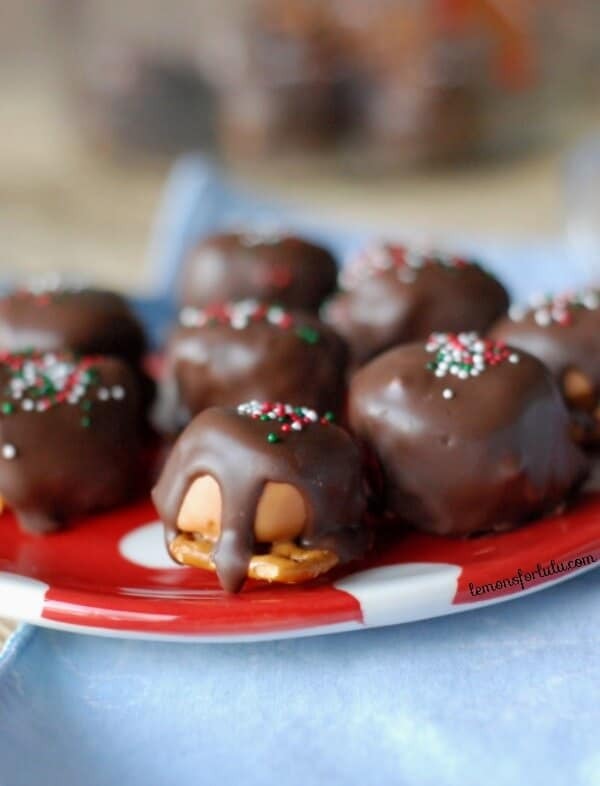 Thanks so much for sharing and love this treat – pinning! Hope you are having a wonderful week! You know Cindy, I’m probably messier than the kids too! Thanks for your kind words Cindy! hahaha, I’m so glad it’s not just my house! I always have great expectations and it always ends up exactly how you described! Then I get annoyed that my kids don’t cooperate long enough for me to have my ‘Norman Rockwell’ moment, and then I feel guilty for getting annoyed when it’s supposed to be “family time”…it’s a vicious cycle 🙂 No Bake treats sound like a plan (and my kids would love these). Thanks for making me feel like my crazy house is somewhat normal! I always walk away feeling guilty too! But truth is it’s just easier when I make alone! Thanks Kim! What a great idea for treats that kids can help with! My nieces would have so much fun! Rockwell’s paintings are wonderful but they’re like memoirs. They aren’t necessarily the way things were but how we think we remember them. The kitchen scene you ‘painted’, Tanya, is much closer to the truth in countless homes every holiday season — and for us viewers, more enjoyable. These treats sound delicious, just as we’ve come to expect when we come here. These look so yummy Tanya! We make something very similar but use pretzels as sticks – the kids just love them! Of course, anything with marshmallows… Pinned! I love your theory! Usually it’s me in the kitchen only and I’m still making a disaster! At least you have someone to blame it on 🙂 These looks so yummy and easy! Too funny…sounds like my kitchen when I’m in there and the family enters. Love how creative these little sweet bites of goodness are! My dad would always get so upset when people got in his kitchen! 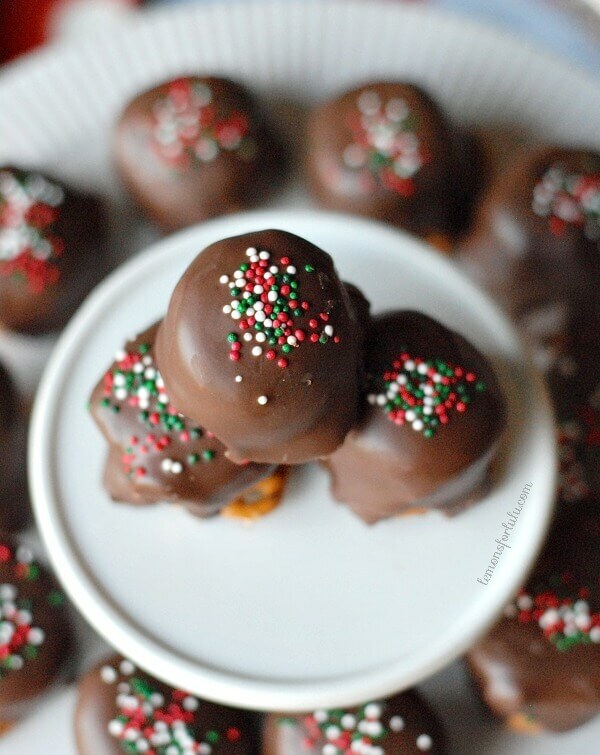 These look totally tasty and like a good edible gift item for coworkers and the like. What fun holiday treats! Thanks for linking up with What’s Cookin’ Wednesday! I love this recipe, and I love your honest take on baking with kids too! I get so stressed out about messes and getting things just right that I hardly ever let my kids help me bake or cook. I think we will give these a try together! I’m not as good about baking with the kids as I’d like it to be. They annoy me! I meet that loving, I really do! Thank you Andi! I couldn’t agree more! No-bake treats are the only way to go, especially when there are kids involved. These little bites look so tasty and fun!! Can you use butter instead or shortening? .. I hate using shortening for things we eat. I really believe the shortening will work best. The chocolate won’t set up right and might separate if you use butter. Those are perfect treats for cookie trays this year. And I absolutely love butterscotch and you never see many things made with it. Yum!!! I agree Jocelyn, butterscotch is under appreciated! Sounds and looks so good! Could you tell me what Chocolate candy coating is? I’m in Canada and not a big baker so I’ve never heard of it. Is there something else that could be used? Thank you! Laura, you could use semi sweet chocolate mixed with a little shortening or Wilton candy melts (if you can find those at your local craft store). Haha – isn’t that the truth, my kitchen looks the same and I don’t even have the kids running around – just the dogs and boy, ha. 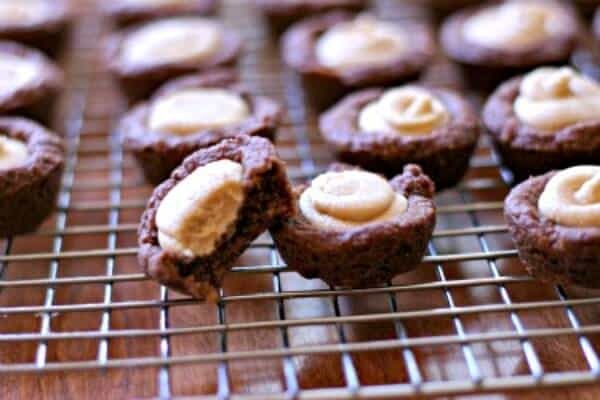 I love the idea of these & am now kicking myself that a) I just found them and b) I’ve never made them! I am so sure YOU would love them Sarah! These are memories in the making, that’s for sure! Needless to say, i’m gonna make another batch of melted almond bark with less shortening. Hopefully that will work. What a deliciously cute idea! Let me know if you hit that harmony! I have the SAME experience year after year! These look really yummy! I’ll have to add this recipe to my holiday baking list! Good luck on the harmony part! I laughed in recognition about your kitchen kid baking experience!